In the vampire genre, there are few names which are as commonly mentioned as Anne Rice. Her work with the Vampire Chronicles redefined what vampires could be in popular fiction and helped to spearhead a new modern, romantic and despondent vampire trope which is still incredibly relevant today. 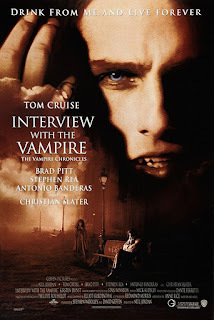 Sadly this month I didn’t have time to reread Interview with the Vampire but I did have two hours to spare and watch what is considered one of the greatest films to deal with the creature: Neil Jordan’s 1994 opus Interview with the Vampire. Interview begins with, surprise, an interview. A young man is interviewing someone he finds very interesting and at that moment, the mysterious man confides in the interviewer that he is a vampire. After a moment of clarification and proof, the real story begins as Louis delves into his past and his birth to darkness. I don’t want to give too much away because this film is an odyssey through the life of a vampire and his companions which spans two continents and multiple relationships. Louis, in a fit of sadness and drunken rage, meets Lestat, a vampire who fully embraces and enjoys his life as a creature of the night. Louis accepts Lestat’s offer and is turned. From here, we are treated to an in-depth study of what it takes to be a vampire, complete with relationship woes, child-rearing drama, and unbelievable guilt. Louis takes us from New Orleans to Paris and back again to America, all the while encountering other, more mysterious vampires and working to understand the inner workings of their society. Louis suffers from a constant existential crisis, never truly understanding who he is and what his life should be until much later in the story. Through his love and loss and relationships, Louis is able to become not only a ruthless killer but also a caregiver to someone. The above summary does not do Interview justice AT ALL. I didn’t want to give anything major away because every element of the story is produced with the utmost attention to detail. Jordan delivers a film that is engaging on multiple levels: it is a family drama, mixed with a transcendental self-crisis story, mixed with a coming of age plot, buoyed on major elements of horror. While there were initial worries in terms of what this film could be, Jordan delivers on all fronts. The acting in this film is also absolutely incredible. Brad Pitt shows every single emotion possible as the tortured Louis. The contacts he wears only help to further his internal struggle. He is loving and monstrous at the same time and this really helps add a level of humanity to a story that is, in essence, about monsters. Antonio Banderas, while only present a short while, was an incredible casting choice as the mysterious and ancient Armand. Also, Kirsten Dunst, while only being 11 at the time of filming, delivers the role of her career and one of which I will forever be in awe. She is lonely and damaged and sweet and manipulative in a way that would be difficult for an adult actress with years of experience to pull off. The star of the film would have to be Tom Cruise as the charismatic Lestat. IN recent years Lestat has gained so much popularity. He is enigmatic and smart and a natural leader. He treats humans with little to no respect but seems to care for his vampire brethren far more. Cruise, although at first doubted by Rice herself, becomes Lestat and fully encompasses the character that Rice had created on the page. The portrayal speaks to the strength of the film as a whole: it is almost impossible to recognize the character as Tom Cruise, not because of makeup, but because his performance just that good. If you haven’t seen Interview with the Vampire, then what have you been doing for the last 23 years. The film is a modern classic, and the performances, direction, music, and especially costumes, only help to further its glory. They say now that there will be a Vampire Chronicles series but I have read every book in the 12 book series and I still see Cruise when I picture the character. Check out this gem and reacquaint yourself with the night.